Eplerenone Versus Spironolactone in Resistant Hypertension: an Efficacy and/or Cost or Just a Men’s Issue? 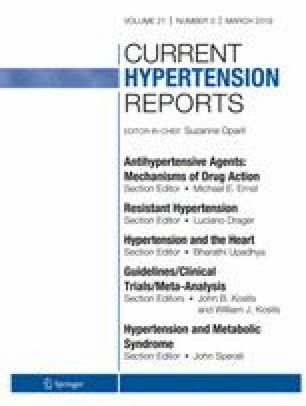 To review comparative efficacy and tolerability data between the two main mineralocorticoid receptor antagonists (MRAs), spironolactone and eplerenone, in patients with resistant hypertension (HTN). The focus was whether spironolactone, being the classical non-selective agent that has been used for years, albeit with several anti-androgenic side effects, can be rivaled by eplerenone, an apparently weaker, but better tolerated, more selective MRA. Evidence has accumulated that resistant HTN is generally volume-dependent, attributable to varying degrees of aldosterone excess with its attendant renal effects of sodium and fluid retention. Such aldosteronism may be due to an underestimated occurrence of primary aldosteronism; however, it more commonly occurs separately from it and independent from angiotensin II. The aldosterone-induced volume excess placed at the root of the development of resistant HTN in a large number of patients, together with the extrarenal deleterious effects of aldosterone, such as endothelial dysfunction, vascular remodeling and increased arterial stiffness, cardiac hypertrophy, and fibrosis can all be counterbalanced by the administration of MRAs. In the absence of a direct comparison between spironolactone and eplerenone, and in light of compelling evidence provided by the recently reported results of the PATHWAY-2 and ReHOT studies, spironolactone has been established as the most effective add-on anti-aldosterone therapy in resistant HTN. The data on use of eplerenone continue to emerge and are quite encouraging. Despite the lack of direct comparative data, the weight of evidence regarding efficacy is currently in favor of spironolactone. However, the data on the efficacy of eplerenone are promising but still being accumulated suggesting this agent as an alternative to spironolactone and certainly as the preferred choice for those not tolerating spironolactone, especially for patients developing anti-androgenic side effects like breast tenderness, gynecomastia/mastodynia, and/or sexual dysfunction. Both these agents appear to have several other pleiotropic effects that confer cardioprotection and renoprotection beyond their antihypertensive effect. Potassium levels and renal function need to be closely monitored during administration of these therapies. Future comparative studies may shed more light on these issues, while emerging newer agents may offer better and safer therapeutic options.